What makes Baylor Basketball Athletic Events Special? 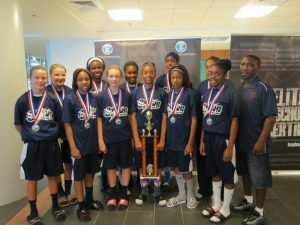 A major component of our charity is hosting AAU Basketball Tournaments and NCAA Certified Events. Our tournaments are designated as either officially approved qualifiers for the Exposure Event, AAU nationals or certified NCAA events. Basketball teams come from cities across the United States, including but not limited to Indiana, Illinois, Wisconsin, Michigan, Ohio, Kentucky, Tennessee,Texas, Oregon, and Minnesota. They converge on Northwest Indiana, St. Louis and Illinois to participate and play against other teams. are used to fund the foundation's mentoring programs. The Baylor Youth Foundation was founded in March 2001 by Toi Baylor. Mrs. Baylor is a former special education teacher, AAU coach, and Athletic Director. She also was a former women’s college assistant basketball coach. Coach Baylor recognized the effectiveness of including enrichment activities to spark curiosity and to develop a love for learning. She also recognized the need to foster self-worth and to develop each youth's self-esteem. BYF fulfills this mission through its focus on assisting at-risk urban youth and those disadvantaged by poverty through educational enrichment activities, artistic, cultural and social programs. Baylor Youth Foundation has several stages which first keeps kids off the streets and gets them through high school with good grades. The next is getting them into college, acclimating them and keeping them there. We realize it is a major environmental transition and we help them every step of the way into a life where they are successful and strong. Your participation in our Athletic Events helps make it all possible and we thank you. Support Baylor Youth Foundation's mentoring programs.